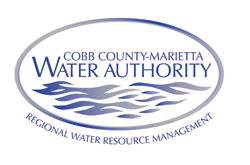 waterSmartSM is a water conservation education program initiated by the Cobb County-Marietta Water Authority (CCMWA) in 2000. Its mission is to educate about the importance of indoor and outdoor water conservation and to help encourage sustainable, year-round conservation, regardless of climate conditions so that all residents can help make a difference and be waterSmart! By partnering with like-minded organizations and experts on water use and conservation waterSmart ensures it's providing the very best information available to residents who are interested in saving water, time and money. CCMWA is a regional public utility that provides potable (drinking and fire protection) water on a wholesale basis to non-residential customers and is the second largest supplier of potable water in Georgia! Although CCMWA does not have direct residential customers, it values the importance of keeping the end water user well informed about the importance of conservation. By creating waterSmart, CCMWA is able to promote responsible water use and protect the precious natural resource of water while maintaining dependable customer service and product quality. CCMWA is proud to be a waterSmart partner.